Space, the final frontier, or at least the latest frontier in micro-games. Not too many micro games do space well (there is Pocket Imperium that is quite neat however) and even less do hand/deck management. Granted, there aren’t many hand-management games out there in the first place, with it being similar to deck-building. In hand-management, you grow your hand of card and thus what you can do, but you never shuffle your cards. 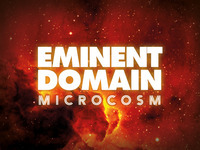 Eminent Domain: Microcosm not only does space and hand-management, but does it in a micro-game kind of way. The latest in the Eminent Domain line (which right now only includes Eminent Domain and expansions, but will soon add Eminent Domain: Battlecruisers), it plays really well while maintaining the main flavor of Eminent Domain. Is it fun? Let’s check it out! This entry was posted in Review and tagged Eminent Domain Microcosm on October 13, 2014 by TopDog.